Now presenting reviews of my favorite thing to eat: Sweets. (In case you hadn’t figured that out already.) For my first excursion, I kept it hyper-local and visited a place just up the street. I hadn’t been in for at least a couple years, so it was pretty much a new experience. 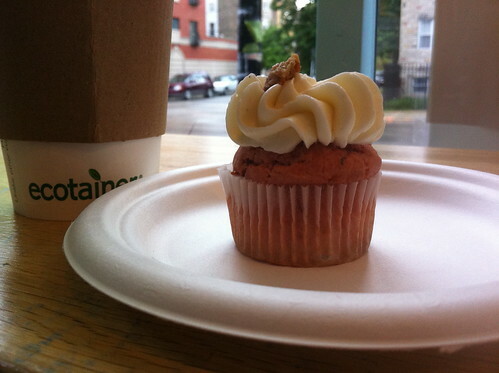 NOTES: I didn’t intend to have a mini-cupcake for breakfast. I was going to have a nice, well-rounded, seated-at-a-table brunch, but our restaurant of choice had a 30-minute wait. And we were hungry. For you, dear reader, I sacrificed a few inches of waistline and started my Sunday with baked goods. 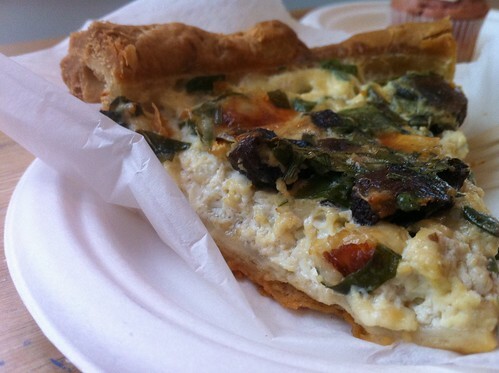 I decided quiche was an acceptable, hearty breakfast choice. 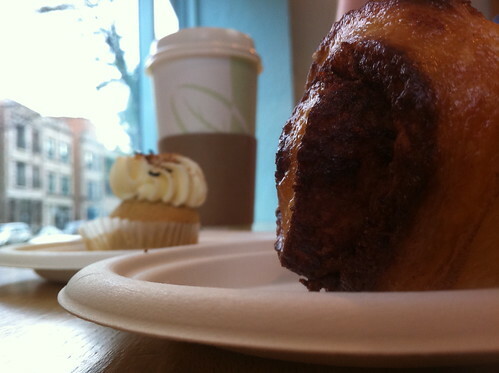 They warmed it up for me in the kitchen, which is viewable from a big, street-front window on Damen. The egg part of the quiche was downright custard-y in texture — super soft and much “looser” than what I’m used to making it home. The vegetables had great flavor though, and the crust — oh, the crust. Firm, but just enough give. It supported all the right places. REAL crust. My mom may be right. I might need to start making my own pie crusts. Sigh. What he DID like, though, was “the mango thing.” He is a man who would happily eat cupcakes for breakfast every day. Clearly we’re a good match.